Sydney is not the easiest place to find your way around. So a good navigation app is a boon. 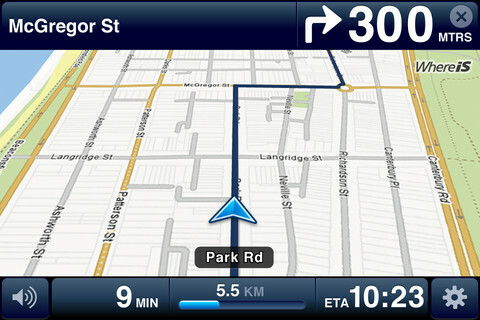 A free one with 3D-view and turn-by-turn directions and no data charges on the Telstra network is even more exciting. And then it isn’t. I’ve been trying out the Whereis app for a few weeks now. Honestly I’ve stuck with it for far longer than I should have simply because I couldn’t believe it was as bad as I kept finding it – I had to be missing something. Well the jury is now in and I don’t believe it’s me, the app is just awful. Where do I start? The interface is clunky. The basic maps don’t look good. The directions don’t always work properly. The search for local business results are all over the place. And that, quite frankly, leaves nothing. The fact that Whereis is a local operation held out hope that there could be something novel and more specific than using Google for example. I just can’t find it. Sure you can search on local businesses but the results are often inaccurate. And that’s not just once or twice, it’s often. A general search on Google will take you much further more accurately. There is the very nice 3D navigation view. I do like that as a means of presenting the navigation information. It is lovely and clear with turn-by-turn directions at the top of the screen. But it’s a waste of time if the directions can’t be generated or, even worse, are just plain wrong. The good news is that the app is free and there are no data charges when using it on the Telstra network. So you can try it out easily. But let’s face it, being free is not an excuse for being bad. This app has won prizes and is well-reviewed in the iTunes app store. I cannot for the life of me work out why; as far as I’m concerned it is, sadly, a lemon.